Frankfort was home to the most famous Kentucky reel makers in history. Their names — Meek, Milam, Sage, and Gayle — became synonymous worldwide with quality and carried notice of the Bluegrass state to the four corners of the earth. On November 10, 2016, the Capital City Museum in Frankfort opened the exhibition “Frankfort’s Fishing Reels: Jewels of the Bluegrass” to rave reviews. This book, put together by long-time collectors Betty Barr and Don Kleier with the help of John Downes, photographer Gene Burch, and the Whitefish Press, serves as a record of the exhibition as well as a history of Frankfort’s Kentucky reel makers. 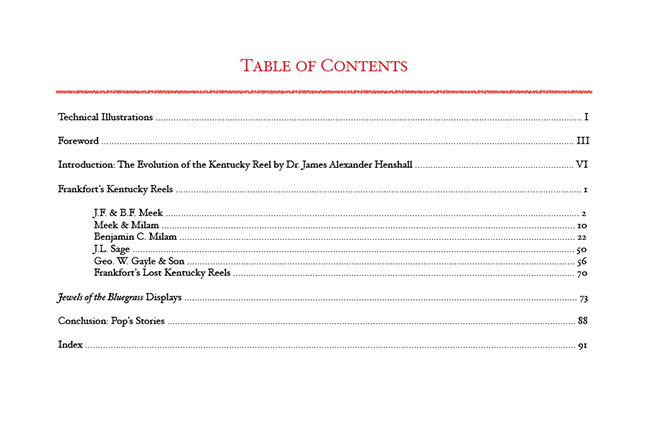 It includes detailed photos and descriptions of 32 different Kentucky reels from Meek & Milam, B.C. Milam, B.C. Milam & Son, Geo. W. Gayle, and J.L. Sage, as well as images of related material including reel making tools, B.C. Milam’s personal fishing kit, and other assorted items. A must for anyone interested in angling, Frankfort, and Kentucky history! This is a fantastic reference work on Frankfort’s Kentucky reels as well as a great history of these legendary reels!